Okay, Spring really is here now. 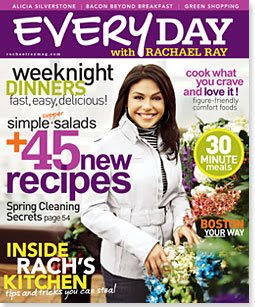 The April issue of Every Day with Rachael Ray has hit newsstands with features like Spring Cleaning Secrets and a cover photo with happy Spring flowers. Can I just say for the record that any magazine with "Bacon Beyond Breakfast" on the cover is a winner in my book? This month's 30 minute meals are: Chicken Satay Noodle Soup, Tango Joes, Penne with Mushrooms, BLTT (Bacon, Lettuce, Tomato Jam and Tuna Steak) Sandwiches, Lamb Chops with Roasted Vegetables and Spring Pea Risotto, Pat's Stromboli Bread, Spring Fish in Parchment, Leeky Linguine with Shrimp, and Indian Spiced Meat with Curried Potato Salad and Creamed Spinach. In the No-Recipe Zone, find out how to make Spring Minestrone Pasta with Crispy Bacon from Editor Silvana Nardone. If you're looking for some sweets, you'll find recipes for Bacon-Crumble Apple Pie, "Yellow Flag" Dessert Skewers, and Banana-Walnut Muffins. Alicia Silverstone shares her own recipe for Crispy Brown Rice Squares. The Burger of the Month looks interesting: Ham Burger. For you travel fans, you can get details on trips to Boston, Omaha, and Taos. And if you're a celebrity watcher, check out the B, L, D, feature on CSI: Miami's Emily Procter and take a look inside Alicia Silverstone's vegan fridge.